Ahhh I love those two little shits so much. 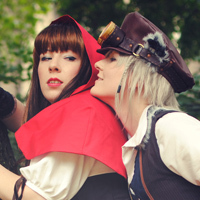 When the poster came out where they had outfits from a time when they were together in Homra, I immediately wanted to cosplay it. It was so cute when they were young and we had so much fun imagining them together as friends like they were in the past... it's more like... sad, ok? SaruMi breaks my heart. 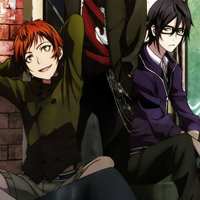 I love the short pants Misaki is wearing though and he looks so cute without his hat. Saruhiko had been a member of the red clan once. Together with Misaki he helped to fight against those who brought chaos into Shizume City. But since Misaki grew more and more attached to the other members, Saruhiko got the feeling of loosing him bit by bit. Thus he ended up closin himself... its so sad. 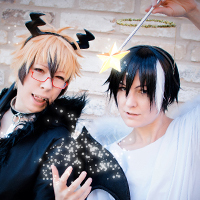 :( SaruMi gave us (and still do) so many feels! 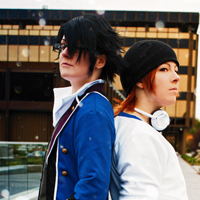 K project - Yata & Fushimi K consumed our life. 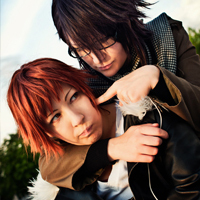 Especially Yata and Fushimi and their twisted relationship. 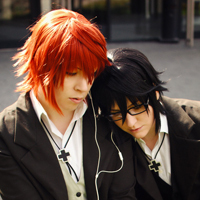 K project - small world SaruMi during their middle-school time! We wanted to create the feeling of "their small world" through our photos. We hope you like it!